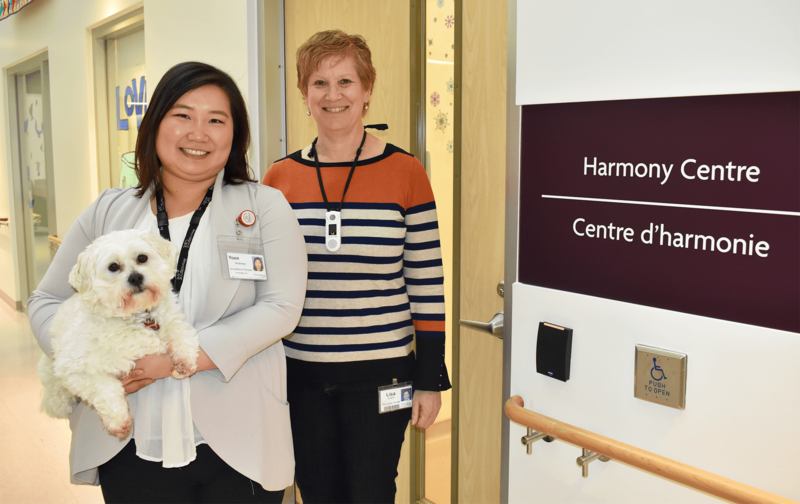 Occupational Therapist, Yoon Andrews and Recovery Guide, Lisa Quanz run the Harmony Centre, a safe space for people living with mental illness. Nestled on the bottom floor of Providence Care Hospital you’ll find the Harmony Centre. And while its bright colours are sure to get your attention, not very many people know what the centre is. But those who do call it a hidden gem. “I like it so much, if I could I would leave a sleeping bag here,” said Terry Sambirsky. “I get excited to come here, because I’m always happy here,” added Chris Litchfield. “It’s an oasis. A wonderful place to come and be welcomed wholeheartedly,” echoed Marty Jordan. 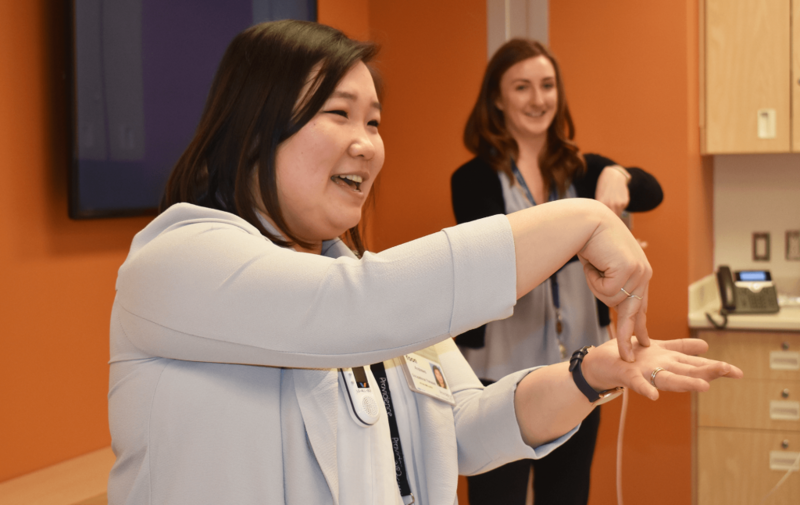 “The Harmony Centre is a safe space for people with mental illness,” explained Yoon Andrews, an Occupational Therapist with the Harmony Centre. 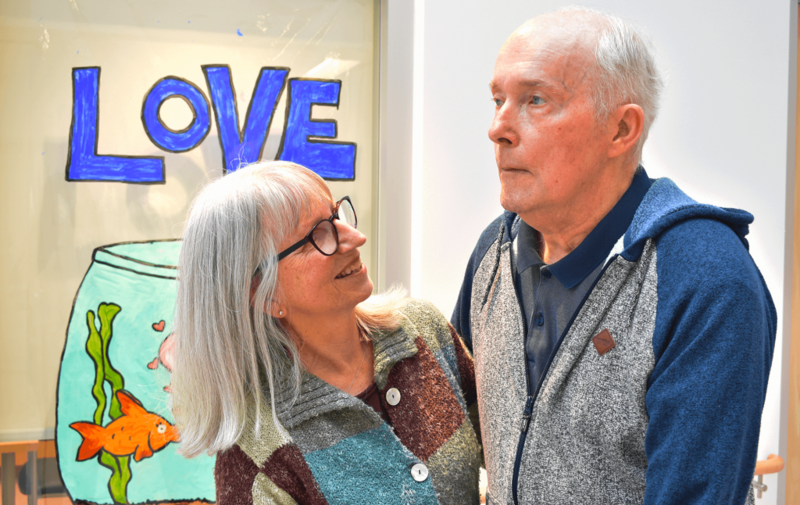 “They could have mood disorders, schizophrenia, intellectual disabilities, or dementia,” added Lisa Quanz, the centre’s Recovery Guide. The program is split into two sessions. 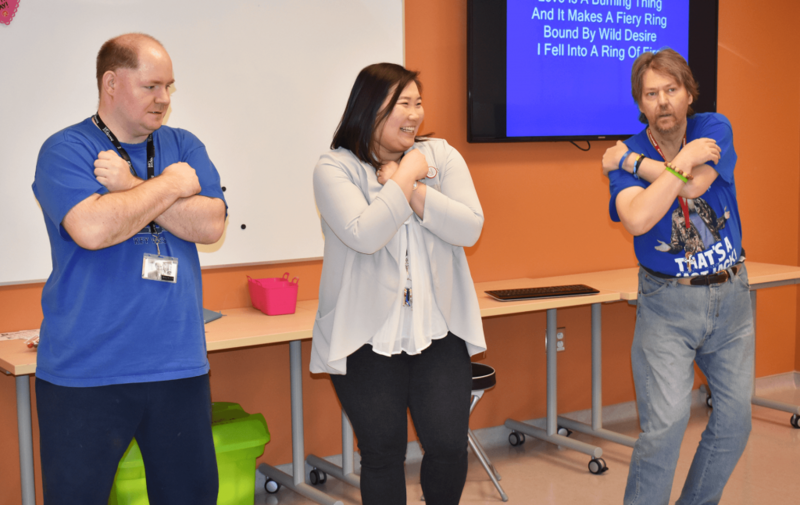 In the mornings, it offers more structured group activities that focus on relaxation and wellness, sign language and music. “They’re productive groups where clients get physically, cognitively and socially stimulated,” said Andrews. In the afternoons, clients choose what they want to do from a wide range of activities; everything from playing cards and doing arts and crafts, to table tennis and karaoke. Clients can come and go as they please, and they decide what sessions they want to attend and for how long. 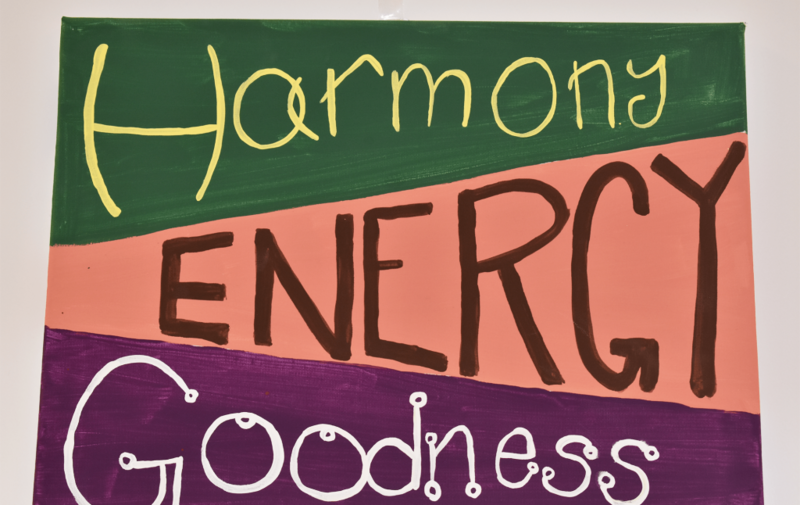 The Harmony Centre also prides itself on its home-like environment. Artwork covers the walls and everyone is greeted with a smile. “It’s a place where people find the fun part of themselves again, and get to explore the potential of recovery in mental health,” explained Andrews. There’s even a pet therapy dog named Baxter, who hangs out at the centre two days a week. “He lets clients hug him, and he’s very, very gentle and affectionate. Clients really enjoy him,” beamed Quanz. Yoon Andrews signs the lyrics to Johnny Cash's Ring of Fire, during Sign Language Group. Chris Litchfield says he enjoys having lunch with Lisa Quanz, because they're friends. Marty and Mike Jordan come to the Harmony Centre every Thursday, for music group. Yoon Andrews says Sign Language Group is popular among clients, because they get to dance. 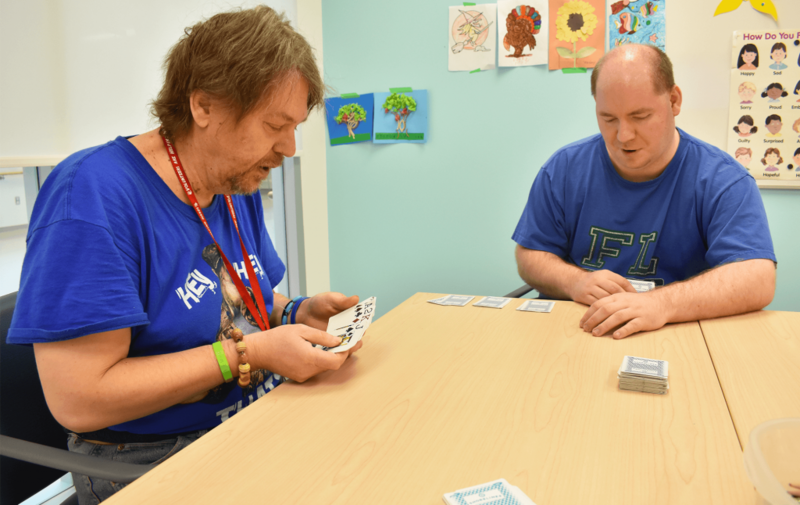 Terry Sambirsky and Chris Litchfield enjoy playing card games, like Go Fish. 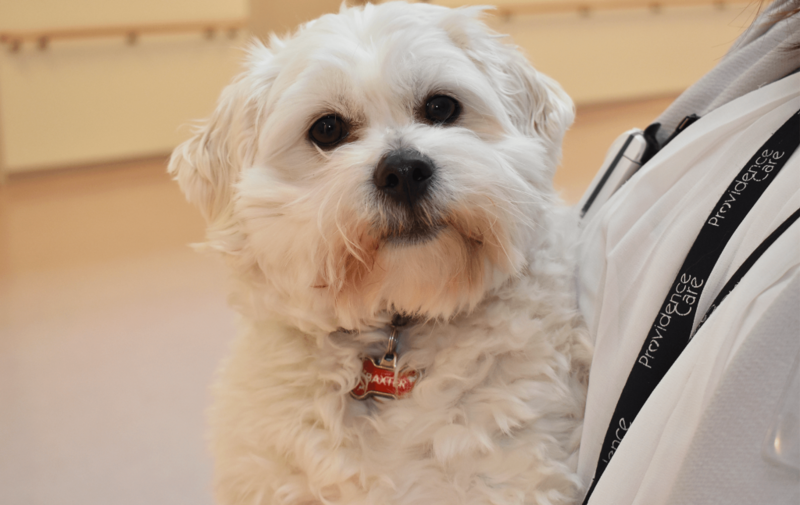 Baxter is the Harmony Centre's pet therapy dog. He comes to the centre two days a week. Artwork covers the walls of the Harmony Centre to create a home-like environment. Marty Jordan calls the Harmony Centre a gift. Sambirsky has schizoaffective disorder and has been with the program for four years. You’ll often find the 52-year-old busting a move on the dance floor. “Terry is a great dancer,” said Quanz. Sambirsky started with the program as an inpatient four years ago and attends twice a week. 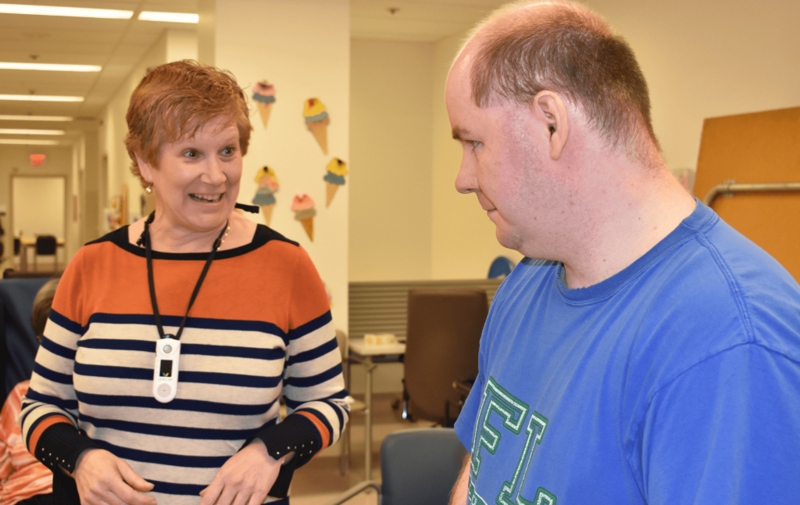 Sambirsky often plays cards with Litchfield, who has an intellectual disability. When Litchfield isn’t telling Sambirsky to ‘go fish’; he’s on the centre’s iPad, or maintaining his high scores on Wii bowling. “I wish I could come here more,” said Litchfield. 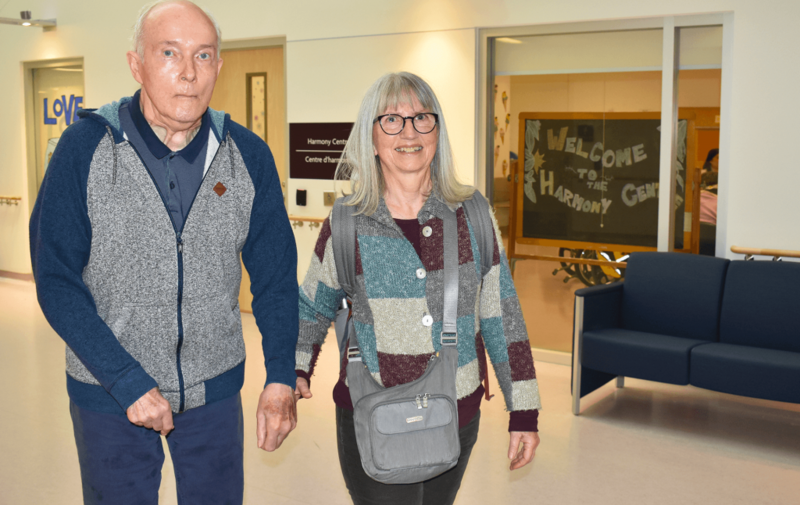 Marty and Mike Jordan happened to be in the right place, at the right time, when they learned about the Harmony Centre. Mike has dementia and now resides on Parkside 2, the Seniors Mental Health unit, at the hospital. Mike can no longer communicate and doesn’t show much emotion. But every Thursday when the Jordan’s attend group dance, Marty says Mike has a little spark. Marty thinks the centre shines as bright as a diamond, but not just any old diamond. “It’s more like that big diamond that Lady Gaga was wearing at the Oscars,” she joked. And while the Harmony Centre probably won’t win an Oscar, Andrews and Quanz say the smiles they see from their clients’ faces every day, is the only award they need. Congratulations on your obviously very successful efforts to help people with mental illness, particularly those with dementia, with dignity, respect and compassion. We have known the Jordans for nearly 50 years and they are both terrific people. It has been rewarding, although painful, to share their journey along the rocky path which is dementia. They bear their burden with dignity and grace. God bless you, Mike and Marty and all those whose lives have been made just a little more joyful because you care. Remembering the beginnings of this program, founded by the wonderful Ann Toman, occupational therapist. The Harmony Centre and the people who work, attend, and volunteer there are true gems! I enjoyed several Summers of volunteering and a semester of placement as an Occupational Therapy Student here – where inclusion, autonomy, and recovery meet to bring out the best in everyone. 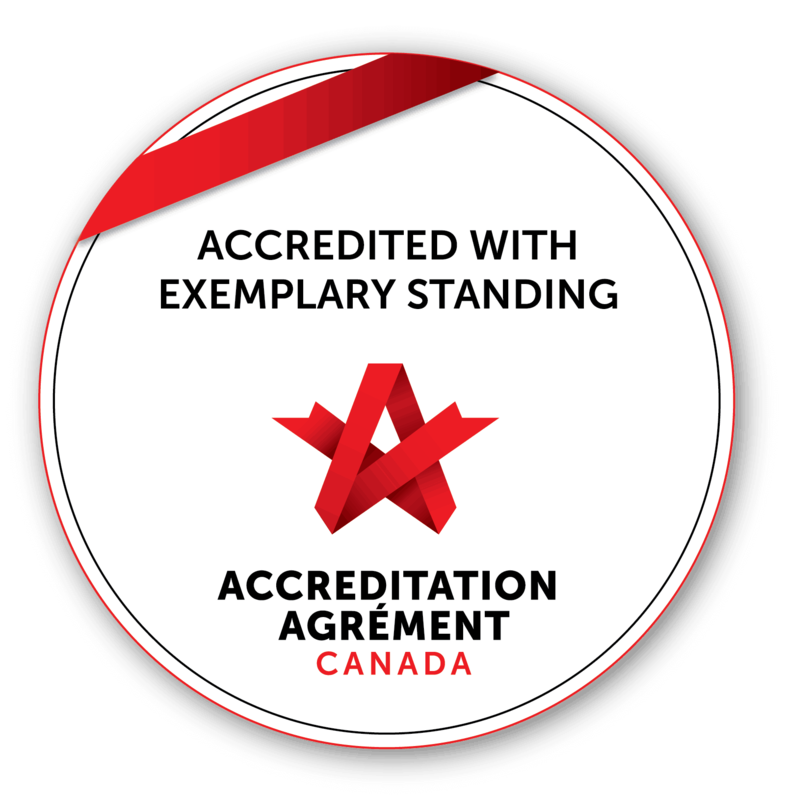 So happy (though not surprised) to hear of it’s continued success!